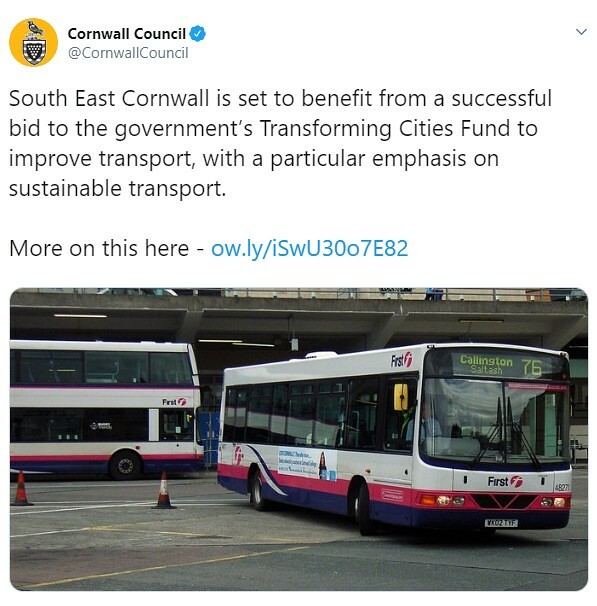 The successful funding bid means that South East Cornwall is set to see a £320,000 investment in transport infrastructure to improve key bus corridors in the Saltash, Torpoint, Rame Peninsula and Liskeard areas. Improvements will include new bus shelters, timetable cases and the installation of digital real time passenger information (RTPI) signs at key locations. Another £516,000 has also been received to deliver walking and cycling improvements in Saltash to provide key connections to Plymouth, support economic and housing growth and manage increased travel demand. The joint bid sees a total of £7.6 million for a number of sustainable transport initiatives in Plymouth. In Cornwall, a share of the funding will go to improve cycling, walking and public transport links between Cornwall and Plymouth. Cornwall Council is now working closely with Plymouth City Council in preparing a bid for the second round of funding.